1. Fry the gum in small amount of ghee, it will fluff up fast into white balls. Pound this gum into a coarse powder and keep aside. 2. Dry roast coconut till it turns light brown and keep aside. 3. Pound small pieces of khariks and make them very fine. Roast this kharik in small amount of ghee for 4-5 minutes. 4. Dry roast khus khus, almonds and cashews seperately. Keep aside. 5. All dry ingredients in a bowl except sugar or jaggery. 6. In another pot add sugar or jaggery and 2 cups of water. Boil the mixture until you achieve a one thread consistency. 7. Then mix all ingredietns into this syrup and mix well. 8. When this mixture is little bit hot, rub your hands with a little ghee. Carefully take a handful of the mixture and make ladoos. 9. These ladus can remain good for lot of days. - The gum cooks very quickly so when frying add very little at a time. Make sure that the gum does not burn or become dark brown. - These ladus are very good for pregnant women and new moms. 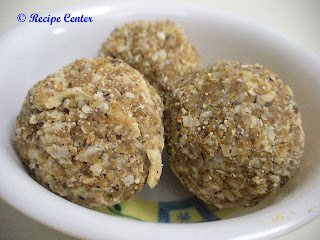 - In cold weather you can eat these ladoos to get more energy.